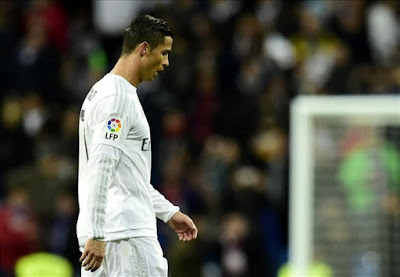 KOORA ONLINE: Man Utd on alert: Was this the moment Ronaldo's Madrid love affair ended? Man Utd on alert: Was this the moment Ronaldo's Madrid love affair ended? The 30-year-old was booed during the defeat to Barcelona and with Louis van Gaal having revealed his interest in signing the Portuguese, could he be on his way out? Cristiano Ronaldo has said he'll retire in four or five years and he'll "live like a king". You won't find many people who would contest that, but there are an increasing number of doubts surrounding where the Portuguese will be when he does eventually decide to bring to an end a career laced with goals - especially with Manchester United and Paris Saint-Germain lurking. Jorge Mendes, Ronaldo's agent, and his co-star in his recently released biopic, says he'll still be at Real Madrid when his playing days come to an end. Florentino Perez, Madrid's president, told Cadena COPE earlier this season that Madrid's all-scoring, all-conquering No.7 is only available for his release clause - €1 billion. But what about Ronaldo? Where does he think he will be when the day arrives that he has to hang his boots up? In fact, where does he think he will be next season? "As I say many, many times, the future nobody knows," Ronaldo recently told the BBC. "At this moment I'm so glad and happy here in Real Madrid, but the future nobody knows." Very non-committal. And what about glad and happy in Madrid? As Los Blancos were humiliated by Barcelona in the Clasico at the weekend, the Portuguese looked far from content. In fact, he looked about as content as those supporters inside the Bernabeu who decided the club's all-time top goal scorer was not above being booed. That's right. Amid the white handkerchief waving and the chants for Perez to resign as president, Madrid's fans turned on Ronaldo. It's not the first time and it seems unlikely to be the last, but it could prove to be the first day of the end of the 30-year-old's spell in the Spanish capital. It's not as if he doesn't have enough on his plate at the moment. For a start, reports suggest his relationship with Rafael Benitez is on the rocks - if it was ever off them - with the Spaniard forced to deny suggestions Ronaldo, along with Sergio Ramos and Marcelo, had complained about Madrid's playing style in a summit meeting. And things hardly got off on the right foot, with the former Liverpool boss refusing to name Ronaldo as the best player in the world on his first appearance in front of the media as Carlo Ancelotti's successor. It's fair to say it's been downhill from there. We don't know - nor may we ever - just how serious the strain is on their relationship, but given the weight and column inches dedicated to the soap opera in Spain, there at least seems to be some sort of credence to the idea that the two don't get on. Reports last week suggested he'd told Perez Madrid "will win nothing" with Benitez. Although that has nothing to do with why Madrid's fans jeered him. They jeered him because of a perceived lack of form - which could, in truth, be in part down to Benitez's tactics. Ronaldo's scored 13 goals in 16 appearances for his club this season, although that's a deceptive stat. Take away the eight he scored in a week against Espanyol and Shakthar and he's only managed five in his other 14 outings. During his last 12 Madrid games, he's hit the back of the net just five times and he's failed to score in defeats to Sevilla and Barca and in the draw with Atletico Madrid. By Ronaldo's goal-a-game standards, something is up. Let's rewind back to Perez a minute here, because while the Madrid president may have pointed to his player's release clause in September, the truth is he may well be rubbing his hands together at the current situation. A popular opinion in Madrid is that Ronaldo's never curried much favour with Perez - he's much more of a Gareth Bale man. His signing. His choice. Therefore, as Ronaldo suffers on the pitch with his form, off it with his manager and in the stands with the fans, Perez may well be eyeing euro signs. And the player himself, with Raul's goal scoring record safely in his top drawer, may be looking to make a fresh start - or maybe an old one. That brings us to Manchester United. Sniffing a transfer, Louis van Gaal has already laid the foundations for a sensational return. "Let's wait and hope," the Dutchman said on Saturday. Patrice Evra, who played with Ronaldo at Old Trafford, said earlier this month that former United manager Sir Alex Ferguson was "99 per cent" certain Ronaldo would one day return to the Premier League club. A new start, meanwhile, would be in France, with Paris Saint-Germain. After the recent game with PSG, Ronaldo whispered something in their manager Laurent Blanc's ear. What did he say? "I'd love to work you," apparently. As Blanc pointed out, though, we will never know for sure. If United or PSG do want Ronaldo, it's unlikely it would cost them his release clause. Perez would probably be more than happy to sell a man who turns 31 in February for £80 million. Throw in a three-year deal and the total transfer would cost somewhere towards £130 million, although a large chunk of that could presumably be recouped in merchandising and marketing. Is he still worth that? Off the pitch, perhaps, but on the pitch that's not as clear as it once was. He's spent the last few weeks having to endure comparisons with Neymar - some people deciding the debate is now who's the next best player after Lionel Messi. With that as the backdrop, everything seems to be coming together to suggest a move away from the Santiago Bernabeu could become a reality next summer. Ronaldo's contract, signed in 2013, runs until 2018, but it's looking increasingly likely that he's not going to finish it. His future has been under the microscope before, but now he seems closer than ever to an exit; his stay in Spain more in doubt than at any point in his six plus years at the club. Ronaldo will retire in four or five years time - but he almost certainly won't be a Madrid player when he does.